This followed our Society stewards' annual training day at the Stephenson Railway Museum. Reporting from all over the country (even the IOM) at 07.30 that morning, 21 had undertaken manual handling training first thing followed by a suicide recognition and prevention course. The later was put on by The Samaritans - their first for a railway enthusiast group - and was sponsored by Network Rail. It was actually far more interesting and enlightening than might be imagined thanks to the presentational style and interest. Although the UK suicide rate is falling, there were still 5,821 in 2017 (of 533,253 registered deaths in total) of which 237 were on the railways plus many more attempted - some of which resulted in life changing injuries. 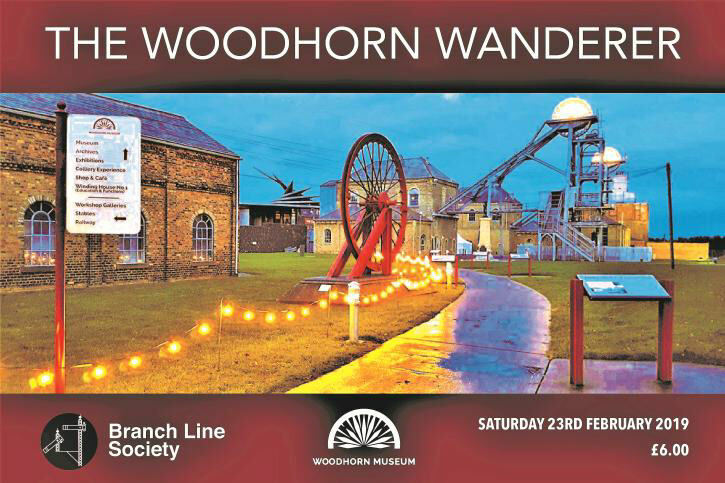 Later that afternoon on the unseasonably mild and cloudy Saturday, 30 members (another full event) gathered at the Woodhorn Narrow Gauge Railway, about half a mile from Ashington and a stone's throw from the Lynemouth Power Station branch. 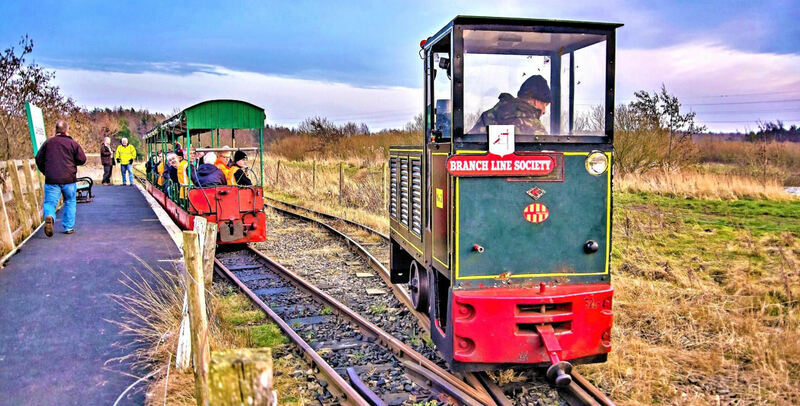 The 1,000yd long 2ft gauge Woodhorn line, laid with substantial rail, is adjacent to both the QEII Country Park and Woodhorn Museum (the former Grade II* listed eponymous colliery, closed 28 Feb 1981 and now a scheduled ancient monument). Public running at this time of year is restricted, 10.00-14.30 but daily, according to publicity posted at the Railway. Your reporter arrived at about 16.00, after visiting the very interesting Museum, to find the volunteers and trains ready. 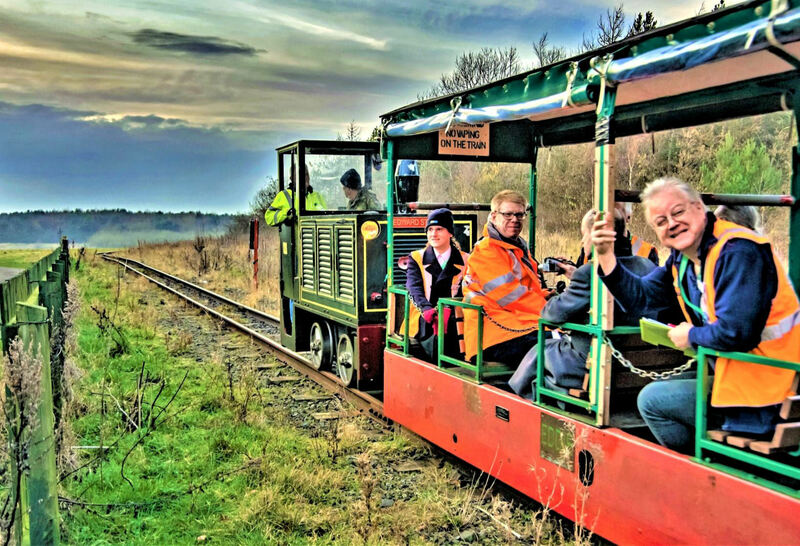 With time to spare (the fixture started at 17.00) the early arrivers were allowed to look around Museum Halt area, talk to the friendly volunteer staff and take photos. The start of the tour at Museum Halt. With a lively blast on the horn, we set out from the Carriage Shed doors, via the loop again, over the level crossing (protected by flashing lights and audible warnings) and with a fair turn of speed/acceleration along the main line! Dusk was falling, and our passage along the 1,000yd run surprised a few late walkers in the park and by the large lake! On two curves the track had been canted for faster running - and we didn't hang about on any of the runs. On the way from Museum to Lakeside. 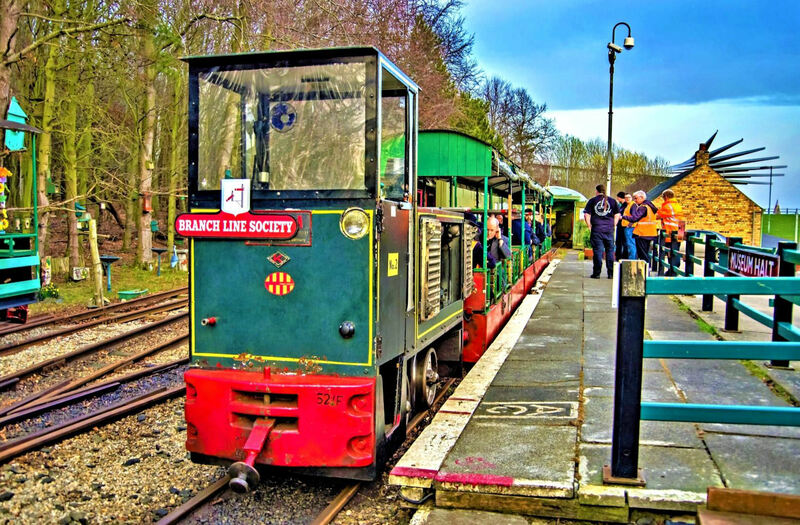 Our tour at Lakeside Halt. At Lakeside Halt, the far end of the line, we ran past the platform to the headshunt points. 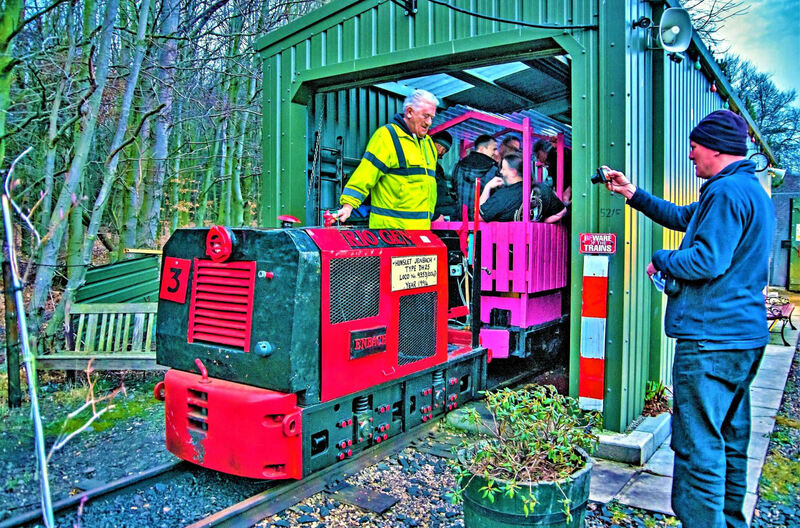 Our loco and riding vehicle were too long for the headshunt and due to the activities of the local feral youth the run round loop pointwork had been damaged, so rare track exploits had to be curtailed! Then it was back to Museum, an interesting propelling move. Back safely, the remaining members were arriving after their day working in the classroom, including the organiser John Cameron. 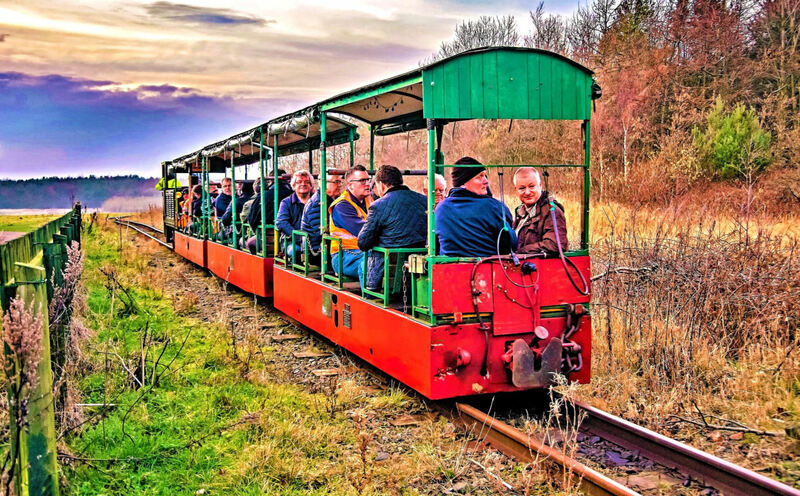 'Jenbach' and 'Ellie' were stabled in the loop and all 30 participants boarded the main train of former man riding vehicles from Vane Tempest Colliery hauled by 0-4-0 No2 Edward Stanton. Now there were seats for all (but no spares) in covered stock! After another out and back trip to Lakeside it was through Museum platform for that all important overlap, and right inside the single track Carriage Shed almost to the end of line. Our later (but on time) arrivals then took to 'Jenbach' and 'Ellie' for another main line trip and 'Edward Stanton' made a few moves to ensure everyone covered all the track. With darkness falling it was time for your correspondent to leave, for a half hour walk along (sometimes) unlit roads to Ashington for a bus to Newcastle (every 10 mins most of the day!). Alighting at the Regent Centre it was the Tyne and Wear Metro to Callerton Parkway for an overnight stay prior to our 'South Gosforth Avoider' next morning. Thanks indeed to the volunteer staff for their hospitality and John Cameron for organisation. 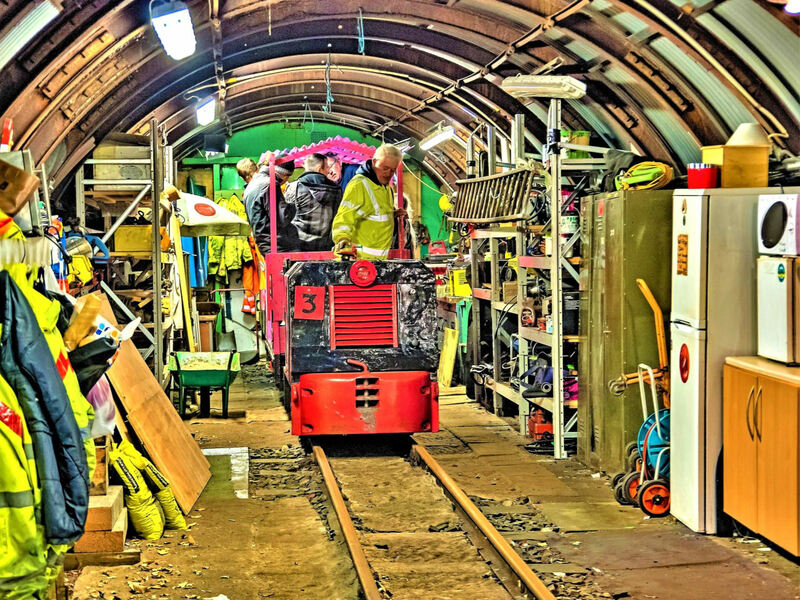 The tour explored the two sheds at Museum Halt. This was taken at the end of the tour in the dark; it's surprising what can be done with modern technology nowadays.